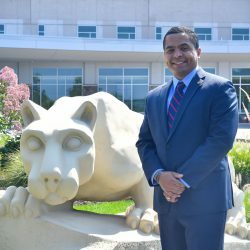 READING, PA. — Jo’Andrew D. Cousins was named Senior Director of Operations of the St. Joseph Medical Group. He will be responsible for employed family and specialty practices. In his role, Cousins will recruit, hire and on-board new specialty and family practice physicians. He also will oversee practice financial management, including monitoring budgets and productivity measures. He will collaborate with hospital service line leaders in the development of the provider components of the service line to enhance clinical offerings and clinical abilities. Cousins in a military veteran with more than 21 years of operations and leadership experience. In 2015, he retired from the U.S. Coast Guard as a Commander. He earned an MBA from the University of Virginia and a Master of Public Administration from the Harvard Kennedy School of Government. He also earned a Masters in National Security and Strategic Studies, U.S. Naval War College and a Bachelors in Political Science from Delaware State University. Cousins, a resident of Oley, was previously employed by Johnson & Johnson.